What makes your wedding different from others? Your destination!Everyone wants a unique and beautiful wedding since it is (usually) once in a lifetime. Weddings are by far the most important day in many people’s lives. While there always is the bride who wants to look like a princess or groom’s mother who wants to show off that “Hum Ladke Wale Hain”, weddings are much more than that. Everyone wants a unique and beautiful wedding since it is (usually) once in a lifetime. What makes your wedding different from others? Your love story, yes! Your clothes, yes! Your destination! Definitely Yes! So from beach wedding destinations to royal affairs, we’ll tell you all! Udaipur has the most luxurious locales for a wedding. The palaces, the lakes and the rich tradition- Udaipur has it all. Also known as the Kashmir of Rajasthan, the place is romantic and beautiful and stands out in many ways. Can you imagine a baarat arriving on a boat? Or guests arriving on top of elephants and the groom waiting for the bride near the lakeside? Udaipur has this and much more to offer, that will make your wedding a memorable one. Well-known resorts: Leela Palace, Oberoi Udaivilas, Taj Lake Palace, Lalit Laxmi Vilas and Trident Udaipur. Why Udaipur: The only place where guests can use waterways to arrive for the wedding and signifies Rajasthan in all its glory. Reaching Udaipur: Well-connected by air with major cities such as Delhi, Ahmedabad, Mumbai and other cities too. Best time for wedding: The perfect time is September – March, since the hot summer can be avoided and the nights are pleasingly cool. With breathtaking sunsets and late night shack parties, Goa is a place of energy, positive vibes and perfect weather. The most important thing in Goa is that you can have a beach-side wedding which will not look less than a fairytale. Goa’s rains will be perfect for the DJ parties and the calm sunsets will make you feel on top of the world. Well-known resorts: Park Hyatt Resort & Spa, Cansaulim and Taj Exotica, Benaulim. Why Goa: The only place where weather is great all year long and the locales are effortlessly beautiful. Reaching Goa: Well-connected to all Indian metros via air and rail. Best time for wedding: From June-September Goa has crazy monsoon rains. November to January are the perfect months. The off-season is March to May when you can get discounts, but the weather is unpredictable. Hyderabad has a number of beautiful properties with gardens and palaces. One such location is the Falaknuma Palace. Falaknuma means “mirror of the sky” and the palace is a huge marble mansion which was built in year 1893 by Nawab Vaqar-ul-Umra. Recently Salman Khan’s sister Arpita was married in the Falaknuma Palace. Well-known resorts: Taj Falaknuma Palace, Taj Krishna, Taj Banjara, Taj Deccan & Vivanta by Taj. Why Hyderabad: For a truly regal wedding in the style of the Nizams. Best time for wedding: From October – March. These are the months with cool evenings and pleasant days. Agra has always been famous for the Shahjahan-Mumtaz love story and is one of the most popular destinations for couples, both Indians and others, to tie the knot. The hospitality and the luxury, the historic importance and the royal feel, the city of love has it all. The setting itself makes the wedding one that people will cherish for long. Well-known resorts: Jaypee Palace Hotel & Convention Centre, Hotel Radisson, The Mughal Sheraton and Oberoi Amarvilas. Why Agra: The city has love in the air and many hotels offer the royal treatment. Reaching Agra: Well connected with major cities. Best time for wedding: November and December are the perfect months as winter weddings have their own charm. Weddings can, in fact be held the year round as the weather in Agra is pretty temperate. If romantic weddings set in the mountains sound tempting, then Shimla is definitely the place for you. Shimla is one of the most popular destinations for weddings in India due to its ambience and the grand ceremonies that can only take place in Shimla’s natural beauty. The snow-capped mountains, the lush greenery and breathtaking beauty will make any wedding the most romantic and unforgettable affair. Well-known resorts: Woodville Palace, Oberoi Cecil, Wildflower Hall, Toshali Royal resort, Shilon Resort and East Bourne Hotel. Why Shimla: Away from the din of big cities, the place is perfect for an friends-and-family affair. Reaching Shimla: Well connected to all metros. 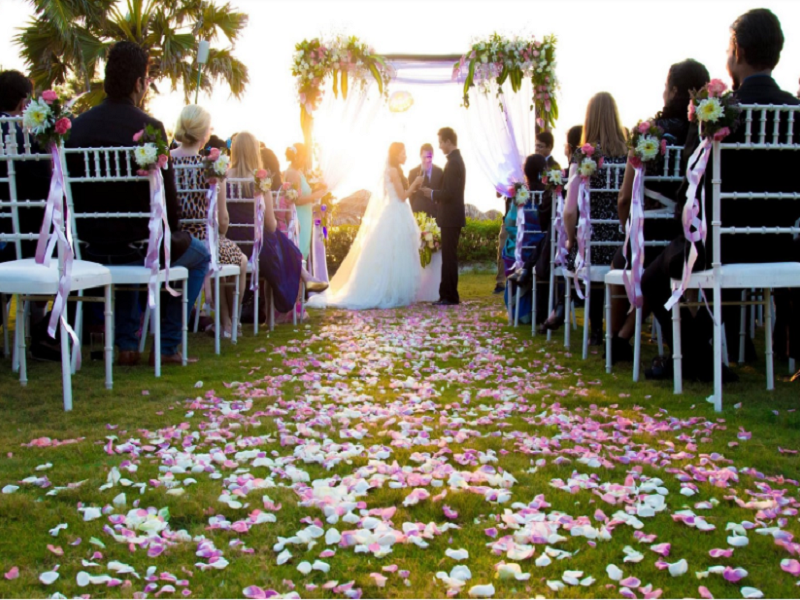 Best time for wedding: During the summer months, since the weather will not be too cold and perfect for outdoor activities as well. If you want a great wedding but you are against jam-packed events, then Kerala is an excellent offbeat option. The calm backwaters and the wonderful houseboats will be etched in your memories forever. Kerala offers traditional weddings according to your preference (Catholic/Hindu). Kerala, just like Goa, also has stunning beaches where some of the functions can be organised. The coconut and palm trees and the fresh sea breeze are more than enough to make your wedding a happy yet relaxed one. Well-Known resorts: The Zuri Kumarakom, Vedic Village Resorts, Kumarakom Lake Resort, Poovar Island Resort, Le Meridien and The Leela Kempinski. Why Kerala: Away from noise and close to nature, a wedding here will be a memorable one both for you and your guests. Reaching Kerala: Major cities in Kerala are well connected to metros. Best time for wedding: October to March is the best time to get married in Kerala. Know of more romantic locations for a destination wedding in India? Share with us in the Comments below!